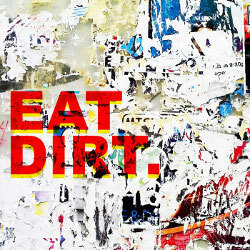 Forming in late 2016, following the spiralling storm of political idiocy and rising tensions throughout the United Kingdom, EAT DIRT are angry. The members of EAT DIRT, previously of well established UK acts, put their frustrations with real life together and have created the bands debut 4 track EP, titled 'EAT DIRT – I', a raging and viceral blast of aggressive punk rock. Their anger is unrelenting and they have lots to say. Musically, EAT DIRT draw influence from The Bronx, Every Time I Die, Gallows and Comeback Kid, building a fast, unrelenting punk rock sound of their very own. They have no interest in “making it”, they don't care for industry politics and will not pander to anyone - they simply want to play punk rock, have fun and release that pent up aggression. 'EAT DIRT – I' clocks in at under 5 minutes, brought to life through the production skills of Justin Hill (ex-Sikth). The message is clear. These guys are frustrated and angry and don't hold back. It's honest and stripped back punk rock, at it's finest.